Anandalaya Sports Day at Mysore: 1.1.2015 celebrated Kalpataru Diwas. Special Bhajan Sandya organized. 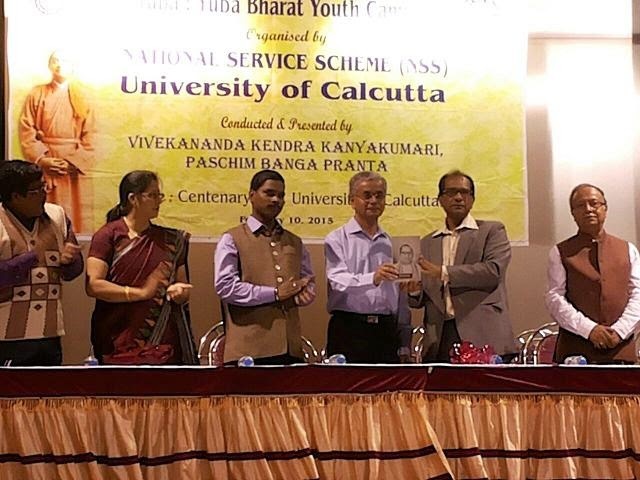 From 4.1.2015 to 9.1.2015 “ Viveka Sourabha” – different competitions conducted for school and college students. Total more than 1000 students participated from 21 schools and 8 colleges. The followings are the different events. 9.1.2015 Quiz, Essay & Elocution competition held at Kendra. 10.1.2015 : Cultural examination conducted at J S S School Sutur. 298 students wrote examination on life and message of Swami Vivekananda. 13.1.2015: Examination conducted at Govt college Madikeri- 71 students participated. On 11.1.2015 patrons meeting held at Kendra. 61 patrons from Mysore attended the meeting. Song, Group discussion and presentation held. Talk on swamiji, Rock memorial and Ma. Eknathji by Sri Rameshji. Sri Gopinathji presided the meeting. Gundlupet, Devalapura, Najanagudu, Suttur, Gavadgere, Konankunte ( Bangalore), Bannur and Vanitha Sadana School, Royal school, K G Koppal school, Maharaja college, 1st grade college Mallavali. Dr. A S Chandrashekar, Sri Rameshji, Sri Ravi Kumar, Sri Narayana Vachaspati and Sri Vinay talked about Swamiji at different places. Evening at Kendra jayanti celebrated. Sri Rameshji spoke on Swami Vivekananda and Anandalaya children given cultural programmes. ANANDALAYA SPORTS DAY: On 25th January, organized sports day for Anandalaya children. Master Rajendra and Kum. Kavya became sports champions. At Ajjampura ( Chikamagalur Dist) :- Vivekananda Jayanthi celebrated at Ajjampura on 18th Januaray. Sri Madhava Rao, Document Writer was the chief guest and Sri Aravind, Teacher, Govt college Ajjampura talked about Swami Vivekananda and his teachings. One of the most wonderful things about our Motherland is how she has withstood the shock of centuries’ of military and cultural invasions and has still maintained her spiritual wisdom and cultural unity. She has held together in a federal form, scores of religions, cults, philosophies and cultural traits, leave alone languages, dress hab-its and living customs. Despite all these she has projected herself as one entity; we may add one without a second. This unity is not superimposed militarily or forcibly. It is a very very natural phenomenon. Just as a huge banyan tree spreading itself with its big and small branches, branchlets up to the tiniest buds maintain its unity, so has Bharat remained as one. This is made possible because throughout the whole huge tree of Bharat the sap that rejuvenates, nourishes and maintains its unity is one and one only. Our great seers from Vedic times onwards understood the great secret behind the universe, as One in the many and made realizing that One the goal of human exist-ence, the sum and substance of it. The result is our “Bharat Mahan” for the whole world to see and emulate if need be. That sap, the One without a second is the power Eternal Truth, the Truth which the great seers divined deep within themselves when they learnt to shut the five sense organs to the world of sense objects. This capacity of introversion, enabling one to climb the citadels of Truth came as natural gift to those who turned their atten-tion from the world outside to the within. Wonder of wonders is their discovery that this capacity for Self-actualization is inherent in every human being. One has only to strive for it. It is this concept of truth, its Oneness that has held this nation together as one entity irrespective of her multiplicity of cultural traits and bewildering complexity of regional character-istics. When money and lust became the twin deities of the world culture, sad to say, India also followed suit. Despite a strong foundation built on Satya and Dharma. Presently it looks almost impossible to turn the cloth back, yet it is the sacred duty of every Indian to help our Mother-land gain back her spiritual wisdom and culture. Attempts we must. India’s cohesion and strength lie in the unbreakable spiritual - cultural thread passing through all paths of the country despite its striking differences in languages, customs, dress and habits. Let us not forget that it is this inner bond that enabled us to gain freedom from the alien rule. Spirituality alone can instill undaunted cultural patriotism surpassing the divisions of the cast, community and religion. We have to help the people to regain this vision of Oneness and for that we need a cultural and spiritual reinforcement in the country. 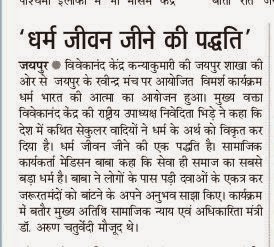 “Satyam param dheemahi” must become the battle cry of the new generation. 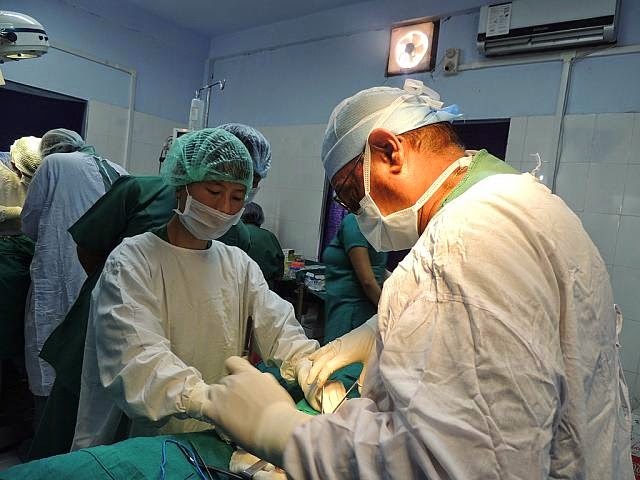 To make this endeavor a success, various segments of society came forward with their whole hearted participation like the Medical authority and staffs of District Hospital,Changlang, District Administration, Local MLAs and other local organizations. It has to be mentioned here that our well wishers from far off places like Gujarat also helped us by sending medicines that were used in the camp. 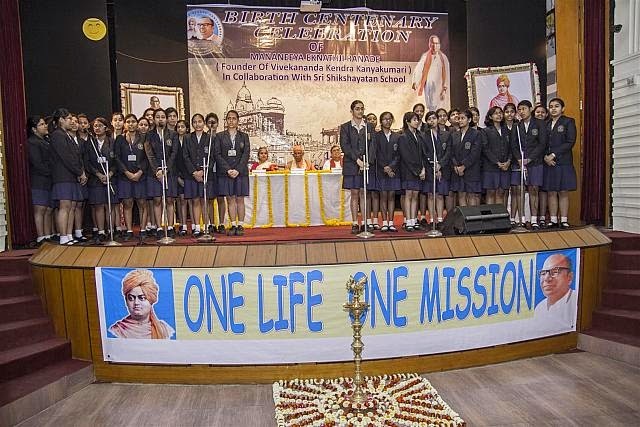 Vivekananda Kendra kanyakumari, Paschim Bang Prant celebrated the birth centenary celebration of Mananeey Eknathji Ranade on today 14th February 2015 at Shri Shikshayatan School, Lord Sinha Road, Kolkata. Total 250 audience presented on this occasion. Justice Altamas Kabir (chief Justice of India) addressing the occasion as the presidential address. 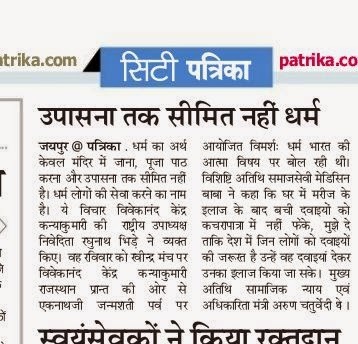 Justice Kabir said that, " Swami Vivekananda didn't mention anything for any particular religion. He advised us to serve people of all religion as 'Narayan'" He also mentioned that he experienced the enchanting of "OM" when he visited the "Dhyan Mandir" at Rock Memorial, Kanyakumari. People get connected with the universe by enchanting "OM". Bare Golam Ali , Md. Rafi used to sing it. ( i.e it is not related with any religious practice, it is the culture of our country). Swami Suhitanandaji, (Secretary, Ramkrishna Mission) mentioned the contribution of Eknathji in Ramakrishna Vivekananda movement as the Chief guest. Nivedita Bhide, (Vice President, Vivekananda Kendra) discussed about live and works of Ma. Eknath Ranade. How he made the mission of Swami Vivekananda's vision with his own practical knowlede for serving the nation. All India Spiritual Retreat was held in Vivekanandapuram, Kanyakumari from 05th to 11th February 2015. The reporting day was 4th February and most of the participants had arrived and reported during the day. Thirty One participants from seven different states viz, Maharashtra (12 Participants), Assam (8 Participants), Gujarat (4 Participants) Tamil Nadu (2 Participants) reported. 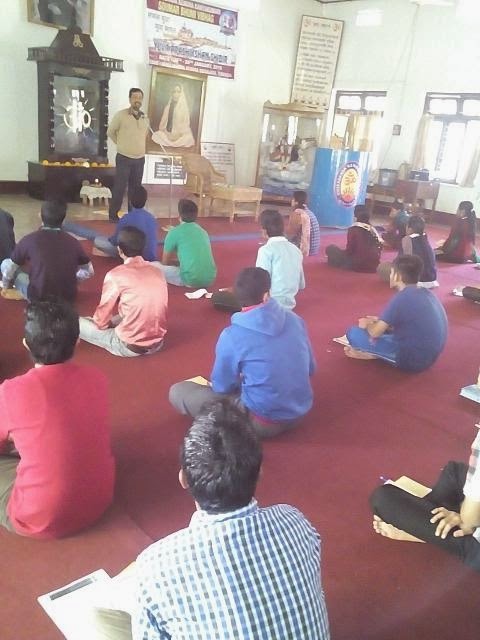 On the same day the participants attended the bhajan sandhya and introductory session, wherein the participants were given orientation for the camp. On 05th Morning, Retreat was inaugurated by Mananeeya Angirasji (Mamaji), Very Senior (1973) Life Worker. The 31 participants were organized into three different groups – three groups and named as Tyaga (English) Seva and Samskar (Hindi). The seven day camp had Morning Prayers, Gita – Pathan, Yogabhyas, Shram – Samskar two lecture sessions, Manthan, Geet – Abhyas, Omkar Dhyan – Meditation, Bhajan Sandhya, and concluded with Ananda Mela. 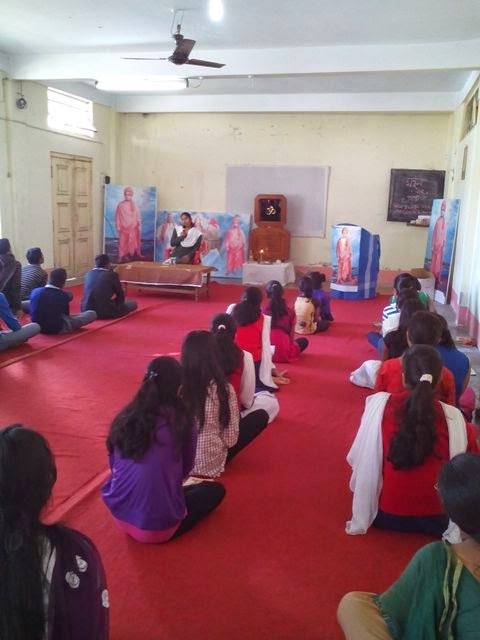 The lecture sessions were on the topics of Concept of Spirituality, Kendra Prarthana, Shrimad Bhagwad Geeta, Acharya Shankara, Swami Vivekananda, Story of Vivekananda Rock Memorial, Vivekananda Kendra – Concept and activities and purposeful life and Manneeya Eknathji Janma Shati Parva Celebration. 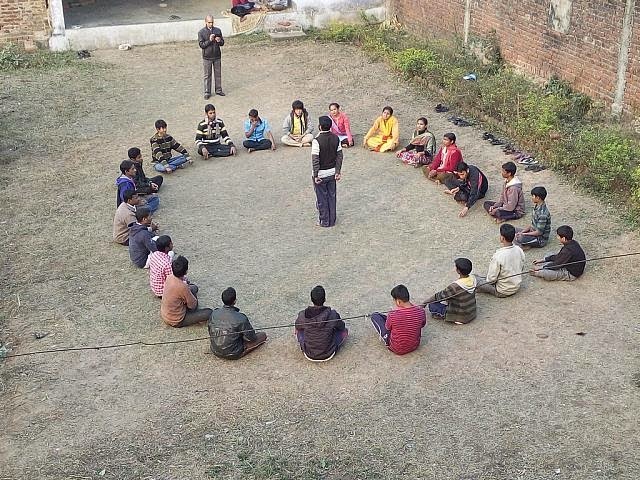 During Manthan Participants discussed over different Chapters from Sadhana of Service. During Shram – Samskar, Participants took care of the cleanliness, arrangement and management of the premises, accommodation, class rooms and dining hall displaying team – spirit and selfless service. During the camp, participants visited Vivekananda Rock Memorial, Kanyakumari Amman Temple, Wandering Monk, Vivekananda Pictorial, Gramodaya and Gangotri exhibition. One day Pratahsmaran was held at Mandapam and participants also enjoyed the sunrise that day. The Retreat went on well in a congenial, spiritual atmosphere with moderate discipline and affection. Many of the participants have expressed their willingness to devout their time and energy for the service of the society through Vivekananda Kendra. Several enrolled as Patrons thus joining the large family of Vivekananda Kendra. 1. “Sri Rama Jaya Rama” Mantra was chanted during Deepa Pooja, Shivalinga Pooja and daily by our Balwadi school children, cultural class students and during monthly meetings by our Balwadi teachers and Social Workers. Every month nearly 7, 78,921 times mantras were chanted in 84 localities. 2. Through 74 Balwadis, 1,998 rural Children were nurtured. In all the Balwadis, Malt along with hygienically prepared highly nutritive lunch with vegetables was served during the day. And in the evening vitamin-rich cereals were provided to the children. 3. 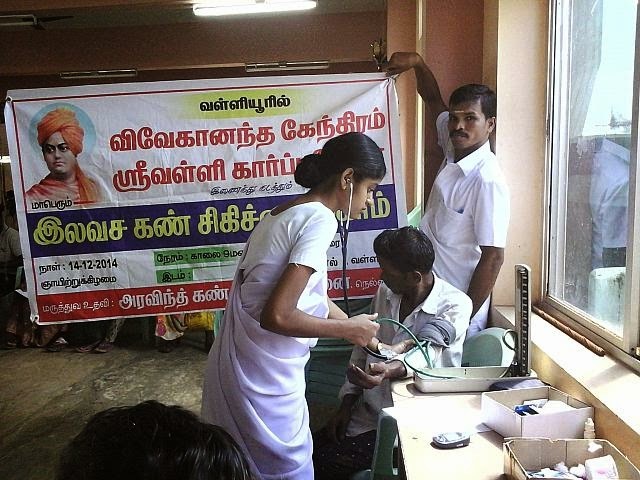 In our Medicare Programme, 2056 patients were examined and treated for various common ailments, through 14 Rural Medical Centers in Kanyakumari, Nellai and Thoothukudi districts. 4. Eye camps were conducted at 4 places, in Kanyakumari, and Nellai districts in which 653 were treated for their eye ailments and 106 were operated for cataract. 73 persons given eye drops and 36 persons given spectacles. 5. 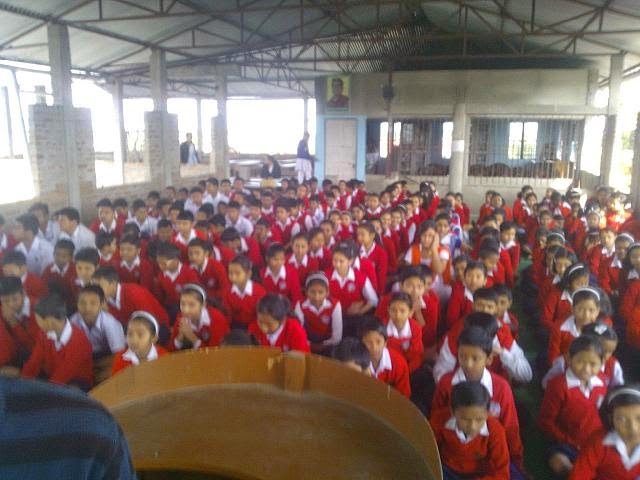 In 187 Samskara Vargas, 8534 students participated. 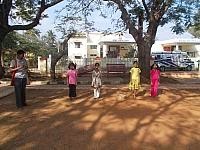 The students were taught about the values of Indian Culture, through games, lectures & lessons. The feelings of oneness were strengthened among participants, through patriotic songs and games. 6. Under Adopt a Grannie Programme, 28 destitute and old people were provided with monthly solatiums, in the form of rice, dhal, oil, etc., for their livelihood and 107 persons provided rice only, in Southern four districts of Tamilnadu. 7. Monthly Deepa poojas were organized in 218 village temples in five districts of Southern Tamilnadu, in which 11360 ladies participated and offered prayers for the welfare of self, family and the society. 8. Under Amrita Surabhi Scheme, our Kendra workers collected 967 Kgs of rice from five districts. 10. Vivekavani Subscriptions for 104 for one year, Also contributions were received for 2 patrons..
14. Shivalinga Poojas were conducted at 03 places in Kanyakumari District and 203 members participated. 15. Durga Pooja was conducted at 03 places, in Kanyakumari District in which 186 devotees participated. 17. Cultural class conference was heldin Vallioor at Nellai district during December 2014. Nearly 245 students from 22 cultural classes participated in the function. 18. Anna Pooja was performed at Paramakudi in Ramnad district and 210 devotees participated in the function and rice collection up to 6500 kgs was collected. 19. Mathru Pooja was conducted in Vijaya Achambadu and Nagalapuram 60 devotees participated. 20. Parents meeting was conducted in Kanyakumari district at 4 places and 105 parents participated. 21. VACS Hr. Sec. School Level boys camp was conducted at Kanyakumari from 27.12.2014 to 30.12.2014. 237 students from 60 schools participated in this camp. 22. Geetha Chanding was performed at 10 places in 4 district and 768 devotees attended. 23. Environmental awareness camp was conducted in seven places near Courtallam and 54 students were participated. 24. 1008 Deepa Pooja was conducted in Thoothukudi Sri. Sankara Rameshwar Temple where 800 devotees participated from 30 villages. 25. PDC Camp was conducted in Vallioor where nearly 100 students were participated. On 31.8.2014 I was travelling in the bus towards Tiruchendur.One person who was sitting by my side wished me by mentioning my name. He introduced himself to me by saying that before 17 years he had participated in the cultural class competiton in which I was acting as the Judge. He has also won prizes. At present he is attending RSS Camps and he is playing Nadaswaram in functions. He has also participated in a function at our Vinayagar temple of Kanyakumari campus. He informed me that he is ready to attend any Kendra’s; function to play Nadaswaram at free of cost and also gave me his contact number. This incident impressed me very much. Once I went to my family deity temple along with my family members which is situated near papanasam which is called Sorimuthu Iyanar Temple to celebrate a function. At that time nearly 30 persons from Adaichani came there in a van and each and everybody enquired my welfare. Also everybody gave me prasadam also to me. On seeing this my family members felt so happy and also informed me that their love and affection towards me was boundless. All of them have studied when I was working as a Kendra teacher which was remembered by them. My balwadi students, cultural class students have been grown up and have not forgotten me. I felt so happy at that time.